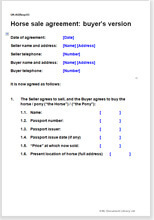 This agreement is a simple way to protect yourself as a buyer of a horse or pony. It is very hard to ascertain whether a horse has any problems or vices at a viewing, even when a vet has assessed the horse's medical condition. By using this sale agreement, you obtain the seller's promise (warranty) that there are no undisclosed problems. If there subsequently turn out to be, then it is the seller who becomes responsible for them, not you. Using this document could not only save you thousands of rands but also much anguish over dealing with a horse that you cannot ride. This horse sale agreement is suitable for 'everyday' horse sales where the buyer needs protection against the horse being medically unsound or not being in the condition the seller describes (such as having vices that weren't disclosed, or not being foal to a certain stallion). If you are the seller, you may prefer to use an agreement that still protects both parties, but that offers less protection to the bueyer than this document. As a seller, using a sale agreement is a good way to reassure a buyer and close a sale, and presenting yours allows you to set the terms and warranties. See Horse sale agreement: seller's version.